When I head to the beach, I need a big bag and a big blanket. For years I used a blanket that was too small to have a bunch of little ones crawling all over it. And comforters and quilts are bulky and heavy. I searched the internet for ideas and, until recently, there wasn’t too many. You can check out my Pinterest Board to see what I found. When I asked my blog readers and facebook fans what their ideal beach blanket is, many said a sheet. They like that the sand shakes off easily. A customer asked me to make two blankets as part of shower gift for each of her two kids who were getting married this summer. I tried the idea of using sheets, fabric, and duck cloth, to add some weight to the blanket so it wouldn’t blow away. The duck cloth is great, but requires a seam to make a wide blanket and can be a bit pricey. My twitter friend, Susan, had planted an idea about using painter’s drop cloth as fabric and I thought it would be a great resource for the bottom of a large blanket. There are many online sources of drop cloth or you can get one at your local hardware store. The great thing about drop cloth is that it is washable and can repel water, making it a great choice for a blanket! I was hoping that the large drop cloth would not have a seam, but the one I purchased did. 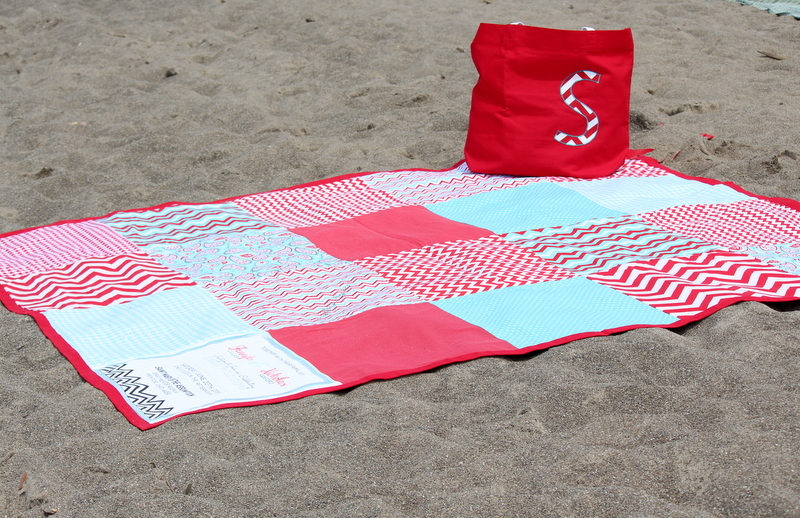 This beach/picnic blanket is 6 feet x 7 feet – big enough to lay down and not have your feet in the sand! Big enough to fit a gaggle of admiring girls. Big enough to play Twister! And nice enough to relax on. Find a downloadable PDF version of the tutorial on my website. I started with the floral and added coordinating fabrics. 1. Wash and preshrink fabrics. I lived on the wild side and threw all my half yard cuts without finishing the edges. I have a front loader and it did not seem to create a stringy mess. But if you want to be sure to avoid tangles of threads you can sew or serge around the fabric before washing. I washed and dried the drop cloth twice. Do the same if you use canvas. 2. Cut fabric into uniform rectangles. I used half-yard cuts, so I first cut the fabric in half along the fold and then squared it up. 3. Arrange fabric pieces in a 4 x 5 grid. When laying out your pattern, arrange the rectangles with the wider side along the length. It will be four pieces across and five pieces down. 5. Place drop cloth on the floor with the WRONG side up. (If there is a seam, the seam allowance side should be up.) Place the blanket top on top of it so that wrong sides are together. 6. Trim the drop cloth to two inches around the perimeter of the blanket. 7. Pin baste the layers together. I use curved safety pins around the perimeter and throughout. 8. Stitch the fabrics together by stitching in the ditch along the seam lines. 9. Baste around the perimeter of the blanket. 10. Bind the blanket. There are several options. A quick method of binding is to use the 2″ perimeter of the drop cloth to self bind. I did this with my duck cloth version and it was quick and easy. You can find instructions here. 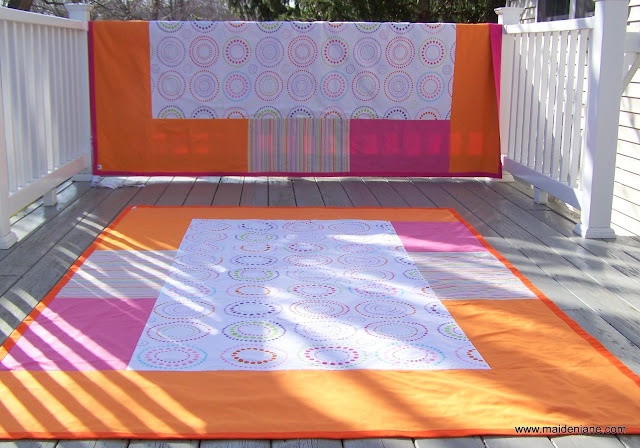 I didn’t want to use the natural color of the drop cloth with the vibrant colors of the quilt top, so I used orange duck cloth to make a binding. I cut four inch strips and sewed them together to create a huge strip. I pressed the seams open and folded and pressed the strip in half. Duck cloth is heavy and thick, so it can be a challenge to sew. I liked the extra weight it added to the blanket. I like to use this video tutorial for applying a binding by machine. I stitched my folded binding to the wrong side of the fabric, going all the way around the perimeter of the blanket. I then folded the binding to the front, pinned and topstitched. 11. Add straps. Create two straps in the same manner as you created the binding. Use 4″ strips to create straps that are about 40″ long. Stitch the straps to the binding. Stitch at the midpoint of each strap. Place the straps centered on the 2nd rectangle along the top. 12. Fold, roll and go to the beach! First, fold both sides toward the center. Fold again toward the side that has the straps. In this case, from right to left. Starting at the bottom, roll and tie. Put the blanket in your oversized beach tote and head to the beach! A beach blanket and beach bag make a great wedding or shower gift! My custom listing is here. So kind of you to share! I love the pictures…that is one lucky guy! Love It ~ Thanks for sharing! Grandmamoy from UK – FABULOUS …but where do you live? Can i come and share your Blanket ??? Heading back to Hawaii soon. This will come in handy……thank you so much for sharing. Heading back to Hawaii soon. This will come in handy……. thanks so much for sharing! Great idea. I really hate small blankets, so you’re either your feet or your head is full of sand. I absolutely need this one!!! As I live at the beach, have to make this for my family when they are here! Great idea, never would have thought of it either, thanks for sharing!!! Since I live at the beach, really thought this is a great project for the family when they visit!!! Thanks for the idea, would never have thought of it, love the gift package too, thanks for sharing! GREAT Tutorial! Loved the colors you chose, and your directions are easy to follow! Thanks for sharing!! LOVED this tut! Thanks for sharing!! LOVED this tut! Thanks for sharing! I have never made a quilt before, but I AM going to make THIS!! I make “sleep & play” “quilts” for the new babies in my family and good friends. I don’t like messing with any pins. I use a bit of Aleens or Elmers school glue to hold my fabric. (I water them down a little so it goes further) It does not shift at all when I sew. When I am done, I soak the project for a little while before washing. The glue comes out. One side of this project is usually something fun or a cloth book panel that I cut apart. The other side is a more “calming” fabric, maybe flannel. The border is usually satin binding. 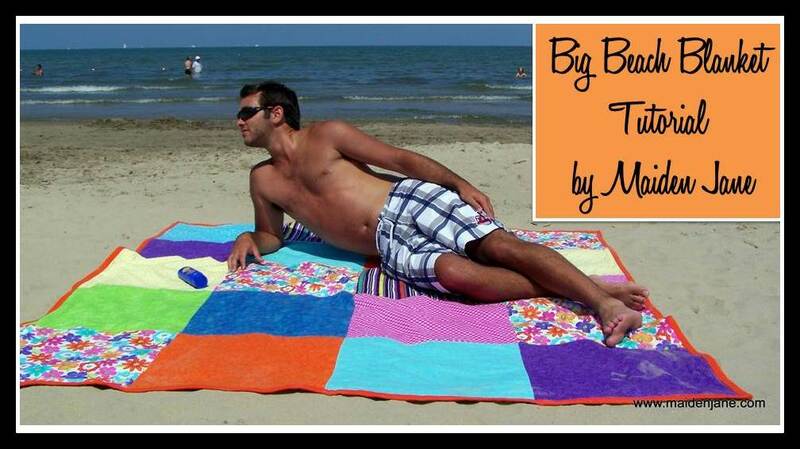 I love this bold and super sized beach/picnic blankie. Thanks, for the tutorial and photos. Another beach bum here up in New England. Another beach bum from New England here just loving this bright and super sized blanket. Thanks for the tutorial and the pics. This past spring my daughter asked me to make a large picnic blanket for her. I found your tutorial and made her a patriotic blanket out of fat quarters, per your tutorial. She and her family loved it. This week I shared it on my blog and linked back to your tutorial. You can find the post here: http://www.reginaatthelake.com/2013/09/it-is-thrifty-thursday-time-for-some.html I hope you will check it out. Thanks so much for sharing the tutorial. I do have a question for you though. Would you have any issues with my selling any picnic blankets made in this fashion on my Etsy store, We Are Crafts (http://www.etsy.com/shop/wearecrafts) or to customers from my Bed and Breakfast? Please let me know. Of course, I could give credit back to you in any situation. Thank you!! Love the drop cloth idea!! I never thought of that!! I love this and cant wait to make it thank you so much. very nice. Hi Joan. There is a lot of variability in fabrics, so I don’t give an exact dimension. I do mention that I use 20 fat quarters or 10 half yard cuts. I prewash my fabrics so they shrink. I then take the fat quarters and cut them to the same size – whatever is the biggest I can get – but they need to be the same size. For the 1/2 yard cuts, I cut it in half – which should be then 2 fat quarters. I start cutting and if I notice a fat quarter that is smaller, then I cut all of them to that size. Weight of drop cloth that is ?? Hi Suzan. That is a good question! Recently, I have been using duck cloth fabric from Joann’s. I believe that is 8 oz fabric. I buy 5 yards and sew it together. The drop cloths are hit or miss. You will want to open up the package. I found, sometimes, that the fabric had flaws. But there are definitely good quality drop cloths, too. I would go at least with 8 oz, since that is what I am using. I prewash everything, so make sure you have room in your washer to do that, too. Thanks so much, Mary! Blogging and commenting isn’t quite the same as it was a number of years ago. But I do like to help anyone with questions on my tutorials!